May 30, 2011 A simple pleasure whenever we visit the Cape, Cooke's Seafood is a fun little place to get something quick to eat. We have probably stopped in here about six or seven times. This restaurant has several things going for it. They have a straightforward menu, with lots of known quantities on that menu. The food is simple, and well prepared. 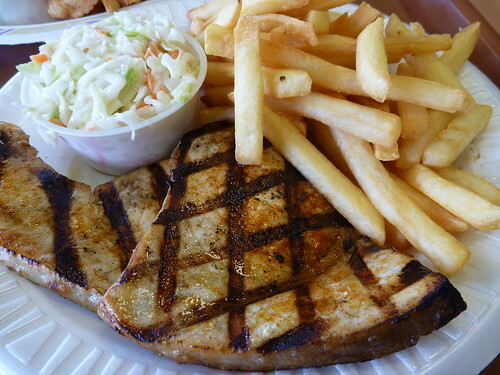 On this occasion we ordered clam strips, grilled swordfish and a side salad. I tried the side salad and it was nothing special, except for one thing: fresh tomatoes. The best tomatoes I have had this calendar year made up for an otherwise very middle of the road salad. The iceberg lettuce was fresh, with no sign of wilting, but those tomatoes were great! They served it with a packet of Newman's Own, which is usually pretty good salad dressing, so the salad was simple but fulfilling. Our food arrived. You can see mine below. It follows the theme of simple, but delicious, although the fish could have stood to been taken off of the heat a minute or two sooner. Mrs. Alphageek's food is pictured below, and it stole the show. 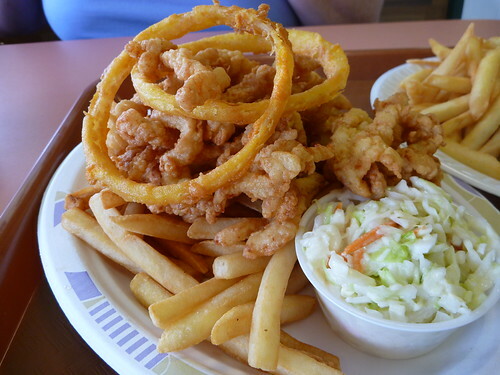 I know you can probably pay more for your fried clams, but it would be hard to get better clams. I thought here onion ring was really good, so get some if you like onion rings. We left Cooke's Seafood, satisfied as usual. We always find this a great little stop while out on the Cape.